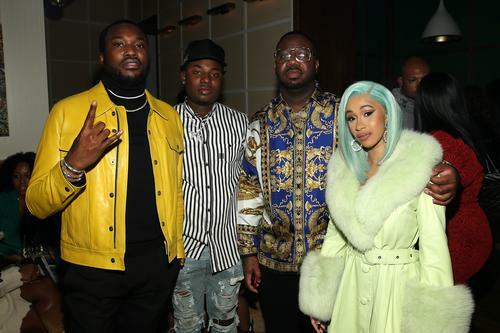 There's been rumblings about a collaboration between Meek Mill and Cardi B for the past few weeks after they were spotted kicking it at the Billboard 2018 R&B Hip-Hop Power Players event. Shortly after, several sources close to both artists said that they did have a collaboration on the way, although there was no word on when it would be dropping. While the release date on the song is still unclear, Bangladesh teased that he might behind the song's production. Bangladesh posted a photo of Meek Mill and Cardi B on Instagram earlier today and teased that he might've produced the collaboration between Nicki Minaj's ex and foe. "When u hear 'Bangladesh' come on before the beat drop u know it’s a problem," he captioned alongside a photo of Meek and Cardi posing together on a balcony. The collaboration from the two might arrive before the end of the year, although that's purely speculation. Meek Mill is set to drop his new album in the near future, although he's insisted that the project's release will be a surprise. Cardi B announced that she has a new single on the way. It's unsure if it'll be the collaboration with Meek, but it would be interesting if that was the choice of her first solo single post-Invasion Of Privacy. Given the tension between herself and Nicki these days, it seems inevitable that the song's release could end up a topic on "Queen Radio."